We’re discussing snags, not domestic violence. Why, Karl? This week, the Bunnings sausage fiasco made it all the way to Parliament House. Why are we not discussing violence against women instead? 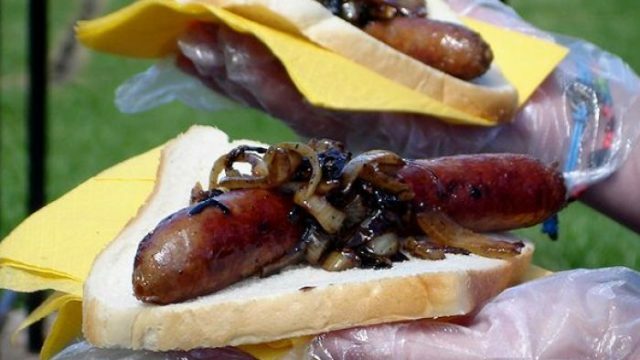 This week, the nation is up in arms because Bunnings are messing with the iconic Bunnings Snag. Everywhere you look on social media, someone is expressing their anger at the move. Television presenters are slamming it as unAustralian. Radio hosts are writing angry letters. Prime Minister Scott Morrison has chimed in. Oh, the tragedy! Meanwhile, Maria Van Beers was murdered by her ex-husband at her Tweed Heads townhouse on November 12. Domestic violence is at epidemic levels in this country. 61 women and 19 children have lost their lives this year at the hands of this abominable act. Nine women were killed in October alone. According to White Ribbon, on average, one woman a week is murdered by her current or former partner. Violence at the hand of an intimate partner is a leading contributor to illness, disability and death in women aged 18 to 44, and domestic violence costs Australia $22 billion dollars a year. How did we let this happen? And why are we not more outraged about these statistics than the location of our onion? As White Ribbon Day approaches on November 23, we will no doubt see a rise in the number of stories on our social media feeds. We will see people like Fitzy and Karl telling us they stand with women. ScoMo will give us a rhetoric-filled speech about stopping it at the start and how effective Australia’s National Plan to Reduce Violence Against Women and their Children has been. Come November 24, we will resume regular transmission and domestic violence will fall off the radar. The way we talk about domestic violence needs to change. Victim blaming is rife, despite evidence that this practice reinforces the attitudes that lead to the perpetration and tolerance of violence against women. In his powerful TED talk, Jackson Katz shuts down victim blaming, arguing that domestic violence isn’t a women’s issue as it’s so commonly touted, but that it’s men that need to step up and start calling out violence against women. “They’ve been seen as women’s issues that some good men help out with, but I have a problem with that frame and I don’t accept it. I don’t see these as women’s issues that some good men help out with. In fact, I’m going to argue that these are men’s issues, first and foremost,” says Katz. So perhaps it’s time for our male television presenters, radio hosts, and Prime Minister to take this advice on board, and start paying real attention to an issue that is killing too many women. The real irony, of course, is that the onion rule exists in the first place. We’re so concerned as a society about safety that a wayward piece of onion on the floor of Bunnings sparks national debate. Yet the safety of Maria and the 60 other women who have died this year is inconsequential. If you or someone you know is affected by domestic violence, please call 1800 RESPECT (1800 737 732). Tracey Clark is an emerging writer from picturesque north-west Tassie. She spends most of the time trying to convince people that she’s normal. Luckily for us, she’s a better writer than she is an actor.